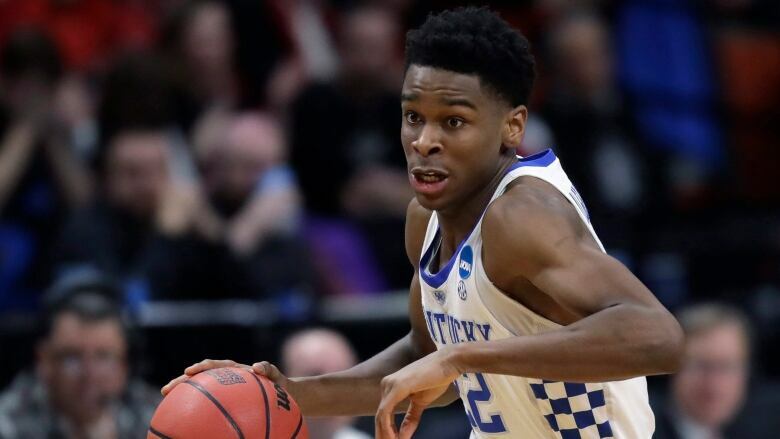 Hamilton's Shai Gilgeous-Alexander is expected to be a top pick in the first round of the NBA draft. When Shai Gilgeous-Alexander walked into a basketball club in Grade 8 with big feet and long arms that he hadn't yet grown into, his coaches couldn't predict that at 19, he would be a coveted NBA draft prospect and could overnight become one of Hamilton's most famous athletes. The Hamilton native is a freshman at the University of Kentucky playing point guard — and now he's 6-6 with a 6-11 wingspan. He's projected to be among the top picks in Thursday's NBA draft. "I didn't think anything different other than the kid has a nice gentle spirit about him," said Dwayne Washington, who taught and coached Gilgeous-Alexander both at Sir Allan MacNab Secondary School where he's a teacher, and at the youth organization UPlay Canada. The coach said Gilgeous-Alexander didn't necessarily have the skill set when he met him at the UPlay development program, but his work ethic was "unmatched." Over his many years of coaching he's seen players work as hard, but not harder. "The thing about him is that he's self-motivated, so when you give him something, after practice you know that he's going to put several hours in by himself," said Washington. He said that created distance from other kids his age and is probably how he got to this moment in his career — waiting to find out which NBA team is going to sign him in tomorrow's draft — and when. Rumour has it that the Toronto Raptors have an eye on the guard. They don't have a pick in the draft, but Marc Stein of the New York Times reported that Canada's NBA franchise is trying to trade into the draft, and has its eye on Gilgeous-Alexander. The Kentucky point guard is a projected lottery pick, but it appears he hasn't worked out for any NBA team, suggesting he already has a promise from an NBA team. Mock drafts have Gilgeous-Alexander going to the Los Angeles Clippers, who have both the No. 12 and 13 picks. Going to Toronto wouldn't be far geographically from his humble beginnings — but it would make him one of Hamilton's most famous athletes to date, at the age of 19. Washington said that as a kid, Gilgeous-Alexander was smart and disciplined enough to know you can develop your skills by sticking with the fundamentals. While most gravitate toward the highlights — the dunks and three-pointers — Gilgeous-Alexander was practising things like 100 left-hand releases in a row. "He was able to work on all the things people didn't want to work on," said Washington. 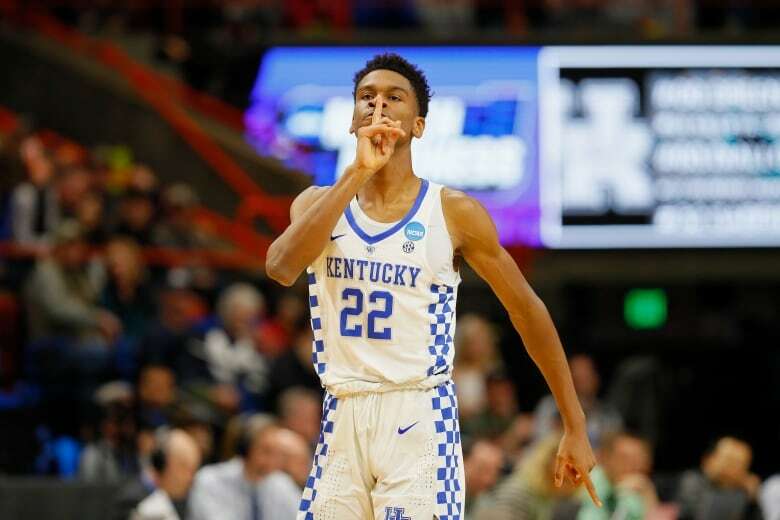 "I can honestly say Shai hasn't skipped any steps"
Gilgeous-Alexander's greatest strength, according to Washington, is his poise. "His ability to not be sped up, which allows him to be able to see things slower and be able to make better decisions because he's not rushing." That's fitting for a point guard who is responsible for setting up the team's offence — and someone who needs to make calculated decisions as he's dribbling the ball up the court. "I think he's wired in a way where he's able to stay calm in situations where most people would not be calm, which allows him to perform better," said Washington. The longtime coach thinks Gilgeous-Alexander will probably be drafted between sixth and ninth. "He's going to surprise people, I believe." As a skills developer coach for UPlay, Frederick Owens was in that same Hamilton gym Gilgeous-Alexander walked into as a Grade 8 student. Gilgeous-Alexander's mother, Charmaine Gilgeous, who competed in the 1992 Olympics as a sprinter for Antigua and Barbuda, was curious about her son's abilities. Owens told the athletic mother, with feet that long, her son could be one of three things — a swimmer, basketball player, or a clown, he joked. Like Washington, Owens noticed the young player's work ethic. "He had an incredible work ethic at the time and that was the thing that stood out most about him," said Owens. "He just simply outworks everybody." The skills developer said they supported Gilgeous-Alexander because of his attitude. "We figured at that time we could teach him the guard position, and with that work ethic that he has, we knew that he would be something special, but it was really up to him at that time," said Owens. "He was just a little kid who was enjoying the game of basketball, which you could clearly see that he had a passion to play." Owens told people to pay attention to the boy, because he's been around the game long enough to know that players eventually grow into their feet. Although Owens spent a great deal of time with Gilgeous-Alexander, he said it was really Washington, the Hamilton teacher and coach, who groomed him. Owens said it all depends on what the NBA teams need, but in May when CBC News spoke with him, he predicted that Gilgeous-Alexander will probably be drafted between 10th and 15th. The NBA draft is Thursday at 7 p.m. at the Barclays Center in Brooklyn, N.Y.